Bogan Pride | Be Responsible – Be Free! What on God’s green earth were her minders thinking? Gillard’s five-day foray into Sydney’s West, hanging out at the Rooty Hill RSL no less, was as pathetic an attempt to re-connect with Labor’s working-class origins as it was hopeless. The western suburbs she thought she was visiting were the western suburbs of forty years ago. Back then, when I was growing up in the slightly more middle-class north-western suburbs, the west was an ocean of fibro austerity houses knocked up in the two decades following the Second World War. You could tell where the old Prospect County Council boundary line lay by standing on the lip of the Hornsby Warp at Eastwood or Carlingford at night and noting where the orange-coloured, sodium street lights began (they were better at cutting through fog in the relatively flat Cumberland Plain). The place was overwhelmingly Anglo-Saxon, V8 Holdens and Fords roared around the streets at night, and you supported either Parra, Wests or (after 1967) Penrith in the footy. The place had a reputation, too. Due to some very silly social engineering by successive state and federal governments, housing estates in the 60s and 70s were erected on vast tracts of erstwhile farmland outside Blacktown and Liverpool. Lots of houses, but little in the way of supporting infrastructure, and nothing in the way of industry and employment. The government just blithely added some extra tracks to the main railway lines and assumed the Westies would commute. Many preferred to stay at home and collect the dole instead. In 1980, if you were a kid from Mount Druitt filling out an application for a job in the city, you’d put down your grandmother’s address in Strathfield, Hornsby or Jannali. Anything but Mount Druitt. Despite the push by the Whitlam government in the early 70s to make tertiary education accessible to working-class kids, few in those early years took advantage of it. Their whole upbringing was set against a background of class consciousness, and a career as a unionized wage tradesman or factory employee was as high as they dared dream. For the girls, a bit of teenage fun, followed by settling down with a family, was the pre-written script of their life. In work or out of it, your cause was best served by voting Labor. The place was an inviolable ALP stronghold. How times have changed. Go drive out along Old Windsor Road and see how the kids of those tradies and factory labourers are living today. Many of them are still tradies, but self-employed, often with several employees of their own. The factories are almost all gone—unskilled labour is cheaper in China. In their place is a peppering of high-tech industrial parks, whose parking lots boast row upon row of BMWs, Saabs, Jaguars and high-end Jap rockets. The fibro houses have been bulldozed to make way for Great Walls of two-story McMansions, with enormous boats parked in the front yards. These are people who have become economic success stories. Labor and the union movement paved the way for their parents’ success, no doubt about it. Thanks a heap mate, catch ya next time. But they aren’t needed any more. These are people who can stand on their own two feet. Who have a voice of their own, and neither need nor want a union speaking on their behalf. People whose interest lies in minimizing tax, and in the government getting out of their way, reducing regulation and red tape. These people are, in Tony Abbott’s words, the Liberals’ new heartland. In fact, the Sydney word westie, meant to connote lack of sophistication, is no longer relevant, and has in the last decade been replaced by the equivalent Melbourne word bogan. So, back to Gillard, and what the hell does she think she’s doing playing the pokies at the Rooty Hill RSL? It’s got to be the idea of her strategist, that Scottish twerp, McTernan, whom Gillard inherited from Tony Blair’s office and imported on a 457 visa (intended to get foreigners work over similarly-skilled Aussies). 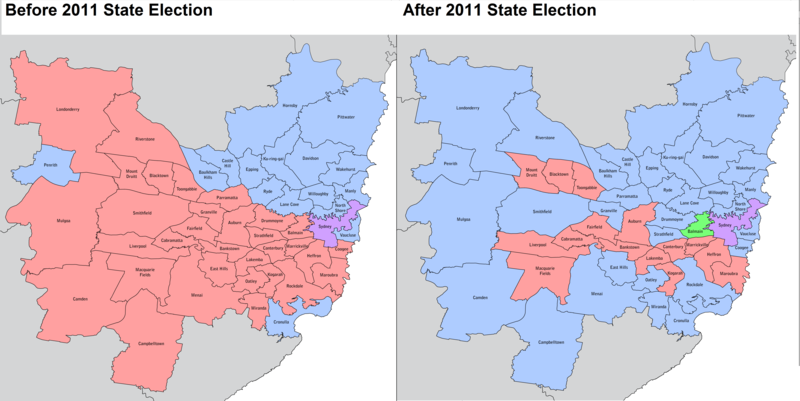 He heard Labor was losing Sydney’s west (in fact, they lost it long ago—didn’t he read about the 2011 NSW state election? ), read that the Rooty Hill RSL was the most stereotypical place in the West, and plonked her there for a week. Bloody brilliant. 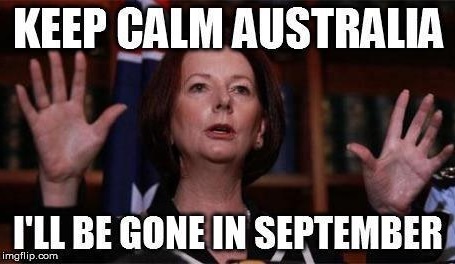 Only now, Julia’s doing door-stops while tapping into old-Labor racism, railing against 457 visas, among other things. Couldn’t they at least have gotten their stories straight? I believe the pshrinks refer to this sort of thing as “cognitive dissonance”. Or did McTernan not even know that RSL stands for Returned and Services League? So when some poor digger tries to ask Gillard a simple question, he’s shoved aside. The only people who have been allowed anywhere near the PM are paid-up Labor Party members, or hand-picked direct beneficiaries of her government’s largesse. She could have met that lot at the ALP National Conference—why bother travelling 90 minutes west of Kirribilli House (the PM’s luxury residence on the shores of Sydney Harbour), when they’d all willingly travel to see her instead? And it didn’t help that when it landed on the reception desk of the Novotel Rooty Hill, her baggage was marked Prime Minister’s Overseas Visit. Meanwhile, Tony Abbott in his time as Opposition Leader has, quietly and without fanfare, visited Sydney’s west over fifty times. He knows what Gillard’s minders don’t: the old Western Suburbs of Sydney are gone forever. The marginalized poor are an ever-shrinking minority, and are rusted-on Labor voters anyway. The upwardly-mobile children of those earlier days are indeed the new conservative, capitalist heartland constituency. There really is no huge, hypothetical block of swinging votes to be won. Labor’s hard-headed number crunchers have known this for years, even if those at the top don’t. Says it all: The West is capitalist now: Labor in red, Coalition in blue (click to enlarge). The whole farce is one big sick joke, brought to us by the denizens of the Canberra Ivory Tower, who have no idea at all about Western Sydney, or ordinary Australians anywhere, and should be turfed out of office at the earliest possible opportunity. I am impressed with your example of high class Oz culture. How not to “meet the people”. Or should that be, how to not meet the people. Interesting clip, especially because his accent was arresting: lots of American-sounding As and flat Ts that sound like Ds (which apparently is a Cornwall trait, as well), but occasionally an English-sounding AH sound in amongst it. Apart from that famous Australian ai/ae dipthong twang, Murray(?) sounded surprisingly to my ear like a southern American. From the vantage point of the mobile, by the way, there didn’t seem to be ‘dozens and dozens’ of people in the bistro, unless it was an exceptionally large one. You remember how last year (I think) I was telling you about the three Australian accents: Broad, General and Cultivated. Well, Paul Murray’s accent is squarely General, except for one or two Broad pronunciations. Most of the Australian-born patrons at the Rooty Hill RSL would be speaking Broad or General; but fifty kilometres to the east, at (say) the Double Bay Sailing Club, you would hear predominantly Cultivated with some General. And don’t forget the short letter i for what I think of as short e: ‘gineral’ instead of ‘general’. As to the hand-picked company Julia has been keeping while slumming it out west, check out this thread on Michael Smith’s blog. Charming. I’ve left my own comment over there. Interesting commentary, Oz, and yes I do remember. You have done all three as a voice-over artist. I’d love to hear you speaking the same lines, in one type of accent after another! Point taken about the popularity of the venue. Off topic, I have just bought a useful and aesthetically pleasing plastic saver-container, which comes in all manner of sizes and which I recommend (the ‘Sistema’ brand). Anyway, I noticed that it was made in New Zealand, which is mildly surprising and goes to show the power of our romantic ideas. The idea that N. Z. might have factories churning out mass plastic goods never occurred to me. I thought that N. Z. only produced beautiful views, hippies, Lefties, academics (same thing, really), and sheep! We now have more cows than people. Cows consider this to be an altogether healthy development.